Are you struggling with interesting blog topics? We’ve all been there, some of us more than others. It’s tough when you want to start creating an online empire and have no clue what you want to write about. Unique ideas are everywhere, but it doesn’t make it any easier when you just starting a blog. That’s why I’ve decided to put together a list of blogging topics or blog ideas to help you get your juices flowing. I’ll even give you some more tips on how to find some more if none of the ones I share make you excited. So grab a cup of coffee and hold on because you’re about to see how easy it can be. I’ll also share my personal experience of what choosing the wrong topic can mean. But first you need to ask yourself a couple questions before you start building your online empire. Are you wanting to start an affiliate marketing blog? If you’re not familiar with affiliate marketing, then check out this recommended training to get some free training and understanding. Maybe you have your own products and want to eventually set up a shop or sell digital courses? Or maybe you’re like me and plan on creating multiple blogs that eventually bring you money? Sit down and think about this question, because it will help you decide what type of topic you should choose. The number one question I see popping up in Facebook groups is what should I blog about? Most new bloggers struggle to find the right niche for their website. I totally understand the frustration. When I started this blog I had no clue what topics to write about. I started sharing my knowledge of WordPress and then I realized that I enjoyed talking about making money blogging and creating passive income streams. After all, that’s what I really love and why I am working on building my online empire of passive income streams. Just know, the niche you choose today, may not be the blogging niche you have a year later! That’s okay, most successful bloggers have pivoted their blog as some point. To be a successful blogger you need to constantly be honing and refining your niche topic. Eventually, you’ll find that sweet spot that you love writing about and best of all makes you money. The more focused you can make your blog, the better you can grow your income. This doesn’t mean that you can’t write about several topics on one blog, you can. But just know that you’ll have faster success with a blog that isn’t spread out among a bunch of topics. If your blog is already set up and you’re looking for inspiration for new blog posts, I always use these places to help me come up with inspiration. Pinterest: This platform is great for helping me come up with unique ideas for new posts. Plus you can see what’s working for other bloggers and write about the same topic with your own unique spin. Quora: I’ve never really been a fan of it, but recently I’ve been paying attention to the questions people have been asking. This Q/A platform can help you come up with a huge pool of ideas that people need help with. Competition: If you spend time reading other blogs, it’s not hard to see what your competition is doing. I’m NOT saying that you should copy them, you’ll have more success if you do your own thing. However, there’s nothing wrong to use other blogs to help you come up with some great ideas for your blog. What if you still haven’t started your blog? Coming up with ideas that make money can be so confusing. Most people, myself included will search for topics that are proven to be profitable. That’s not a bad thing, after all, you do want to make money. But if you’re not interested in the topic, you’re going to have a HARD time making money. It takes a long time for a blog to become profitable. If you can’t see yourself writing 50-100 blog posts in that niche, you shouldn’t start it. 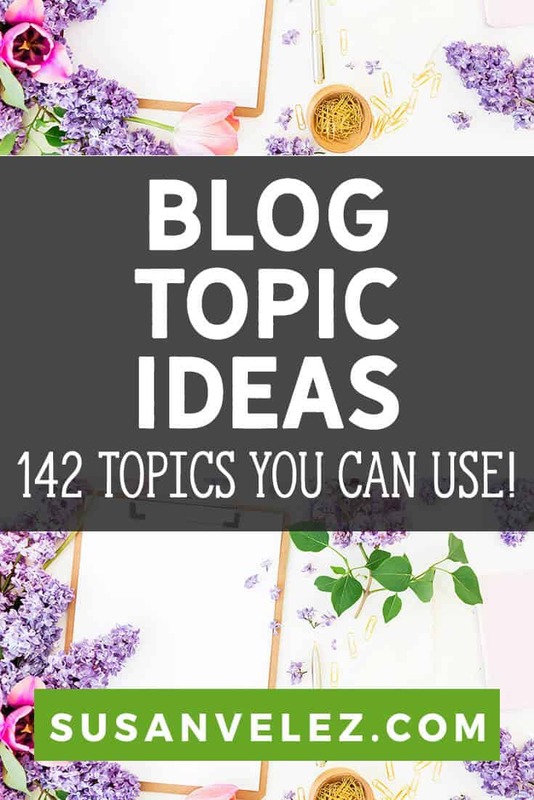 Don’t worry, I’m going to give you a huge list of topic ideas that will help you get started. Unlike other lists, I’ve taken the time to put this huge list of blogging ideas and sub-topics together for you. I had no clue what a subtopic or sub-niche was when I first started. I ended up wasting too much time chasing niches that were too competitive. I recommend using a keyword tool to make sure that there isn’t too much competition. Hopefully, this site helps you start your own affiliate website. Don’t forget to check out my step-by-step tutorial on setting up WordPress. Everyone wants to look great and stay young forever. If you are passionate about health and beauty, you can totally start a blog in this niche. Check out my post these fashion blog post ideas to help you get started. We all take our health serious and the health and fitness niche is huge. I’ve shared just a smidgen of ideas that you can use to help you get started in this niche. If you start a sports site, there’s a good chance that you’ll be creating a seasonal site. Check Google Trends to see what the traffic is like for that particular sport year round. I recommend checking Google Trends for any site that you’re getting ready to start. This will give you an idea of whether it’s a dying trend or there is still interest in that particular niche. We all love our pets and millions of Americans are willing to spend money on their pets. This is a lucrative niche that will help you make money. Read this article to see how much people are willing to spend on their pets. Budgeting and making money is something that interests millions of people. You can start a blog that teaches people how to budget their money or even make more money. Everyone has a hobby that they love and it’s possible to make money with your favorite hobbies. You’ll find tons of keywords I found that can help you brainstorm more possible ideas. This is one of those niches that do extremely well on Pinterest. If you’re a crafty person or know a lot about home decor, you can create a profitable blog and YouTube channel by sharing DIY projects. I know that a lot of people tend to chase the ones that are the most profitable. Heck, I’ve done that before in the past and I can tell that you’ll likely fail. You’re going to need a lot of content for your blog and if you don’t enjoy the topic or are not interested in it, that’s just asking for trouble. It doesn’t matter if the topic is profitable if you hate writing content because you don’t enjoy it. Your blog will feel like work and before you know it, you’ll drop it like a bad cold. Instead, choose something that you really enjoy or want to learn more about. You don’t have to be an expert in the niche, but you should have some interest in it. As I mentioned above, you need to be able to write 50-100 blog posts on that topic. Otherwise, find a different one, there are plenty to go around and I have no doubt that you’ll find something you love. I’ve been in positions where I just chased the money and didn’t care whether or not I liked the niche. Yes, I was able to make some income, but I hated writing for my blog. I ended up wasting a ton of time chasing something that had great profitability but I hated it. Don’t do that, instead focus on something that will make you money but you actually enjoy working on. Most every niche has potential to make money. Imagine if you can create a digital asset that can bring in $2,000 – $4,000 passive income. If you can create one website that makes money, what’s to say that you can’t create two or more? That’s the attitude that I’m taking from now on. In fact, that’s the reason that I started my other blog. I figured if I can create more passive income streams instead of just relying on one, I’ll be able to sleep better at night. There’s no better time than now to start a blog and create passive income. While you won’t see a return on your hard work right away, but the seed you plant today has the opportunity to earn you passive income over time. If you’re ready to take control of your of your future, then you need to put in the work today. If you’ve never had a blog before, be sure to check out my simple simple tutorial on start a blog step by step. Are you working on a blog that will help you create a side income? If so, let me know if you plan on turning it into a full-time blog and what you’re doing to achieve your goals. You’ve left no excuse to put off blogging. PS: I think you’ll like Quora the more you use it. And it is GREAT for getting topics and ideas in your niche. Hopefully, this list will help someone who doesn’t really know how to find new niches. I used ot struggle with coming up with ideas in the past. Now it’s so easy to come up with them, I just don’t have enough time or energy to pursue them all. Sometimes I also find it as a problem finding new topic ideas to write for my blogs in various niches. This list is great and it really gave me an AHA moment. I also use Ahrefs Content Explorer and BuzzSumo to generate content ideas. Both of these tools are paid but also have a trial version which I would suggest everyone check them out. Another option, you can use is AnswerThePublic where you can type your main keyword niche and then it will generate keyword ideas. I’ve personally never used Ahrefs but have heard good things about it. I personally like SEMRush, although I don’t pay for it every month. Totally forget about AnswerThePublic and Buzzsumo which I’ve used before. Thanks for reminding me about them, you can bet I’ll be using them again the next time I’m looking for content for my sites. Hi Susan! It’s great to meet you. Wow! What a monster list you’ve got here. One thing I really like about this is the examples can also show people how to break things down and look for interesting subtopics, which can be applied to other niches as well. I agree with Donna that Quora can be a treasure trove once you get used to it. It’s also great for ideas because once you do write a post on the topic, you can always go back and answer the question with a link to your recently published article as well. Thanks again Susan and hope to talk more soon! Glad you like the list, hopefully, it will help someone who has struggled to come up with a topic for their blog. Thanks for the tip on Quora, I’ll have to set some time aside to learn more about that platform. I really haven’t given it any attention.